New flight routes: Darwin from Cambridge to Geneva, Transavia from Paris to Chambéry, Swiss from Gatwick to Geneva, easyJet from Manchester to Lyon, Flybe from Birmingham to Lyon & Southampton to Grenoble, Blue Island additional flights from Jersey/Guernsey to Geneva & Chambéry and BA have the return of the London City to Chambéry service. New Lift Pass Option: New for 2014 is the DUO pass discount (2 adult passes, min 6 days, same type and duration, bought together). This for example gets a Courchevel 6 day pass for €224 instead of €234. The Tribu discount (for 3 passes bought together) continues too. 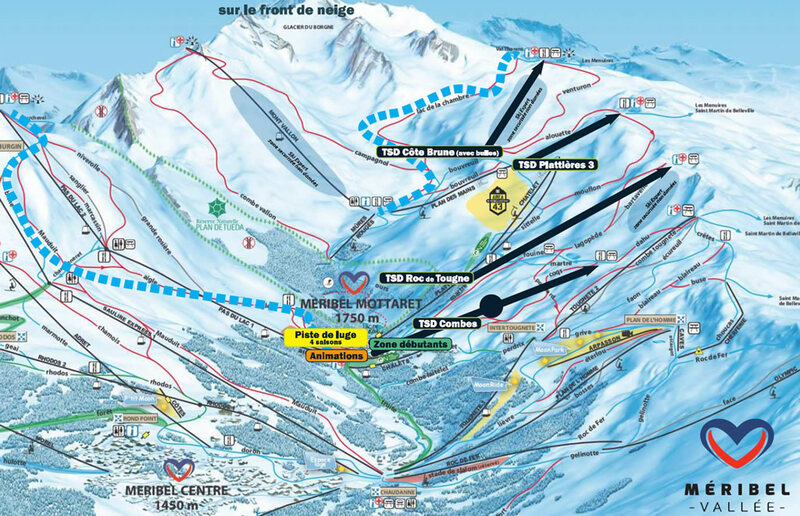 Lift Passes 2014 and the Piste Maps 2014 are updated. Les 3 Vallées are putting on another big Après party on Thursday 31 October at Fulham Broadway with the Folie Douce and Ibiza Rocks crew. It's at The Broadway House Bar & Grill (the club bit upstairs at what was The Slug & Lettuce next to the old Tube station entrance - aka "The Slug"). The big news this Winter is La Tania has a brand new high speed 6 seater chairlift replacing the long Bouc Blanc drag lift (which has now been shortened and renamed Stade as it gives access to the La Tania Stade, the slalom event piste). 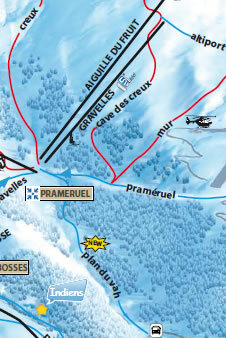 In addition the Praz Juget drag plus the Cretes and Col de la Loze old slow chairlifts have been removed too. The removal of the drag lifts means no lift to the top ridge in really bad weather but then you'd probably want to stay lower down anyway (although the line of the new chair is more sheltered than Dou des Lanches which can close in very high winds). The alternative routes to the slow chairs that have been removed are much quicker for any reasonable skier or snowboarder. The new 6 seater detachable chair will have a capacity of 2,700 skiers per hour at 5.5 m/s with a total length of 1853m and vertical rise of 553m. There are 17 new pylons and 92 chairs. Cost €7m. 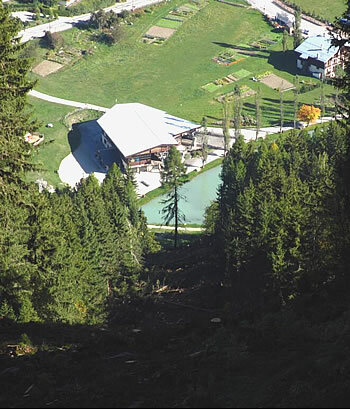 In addition, work has started on the the new Forêt chair up from Le Praz which will now terminate near the top of the La Tania gondola - this lift is scheduled to open in December 2014. The construction in pictures with the plans here plus a September update and the official video. The return of Bring Your Sisters after Stevie & Della's year long honeymoon will see Westy filling in for Gareth (still AWOL in Canada), but the usual madness & nakedness should prevail. Looking like Tuesday Après Ski at Pub Le Ski Lodge and Sunday nights from 10pm back at La Taiga plus Tuesday Après at Lodge du Village (to complete the list - it's Jack's Bar in Méribel on a Wednesday Après and La Boulotte in 1650 on a Friday Après). We also hear The Dominos will be the Tuesday night slot from 10pm at The Ski Lodge and even a brief visit by Shibboleth is planned - hopefully early January will see Graham (Curious Bullets), George (Bjorn Again), Colin (The Strides & The Mooncutters) plus both Bodo & Steve on the drums return for a couple of gigs. Meanwhile Les Trois Tetes are heading for India but Freddie Fingers will be playing out here in a new band - more of that soon. Another Feeling gig / festival in Méribel could be on the cards now they've finally released their new highly acclaimed album Boy Cried Wolf. The Elements is the latest band with ex Ram Raid bass player Abe who will be out here this Winter and another new band out to the Alps for a tour this Winter and with a growing reputation are The Banquet. Finally, The Cheerleaders have a new project, Sunset Sons - expect to hear more of this soon. It's the 20th Anniversary of Pub Le Ski Lodge this December so expect a big party to celebrate - we're hoping for 1993 prices that night! Anyone got any Francs left over? Also, La Taiga is having a bit of a refresh, paint job etc ready for those crazy Sunday nights! Returning staff details soon. Meanwhile the Ibiza Rocks The Snow line up for their first December week has been announced with MistaJam, Clean Bandit, DOORLY, Nicola Bear, Ste-V-Something, Patrick Nazemi, K1r3y plus official Club partners Propaganda, We Are Your Friends, Troupe Records & Spacestation. Joey, (aka Joadie Roadie) is all set to start up his new Sausage Business this year - so stand by for some quality and different types of sausages on some menus around The Three Valleys this Winter. All his licences and regulations sorted, premises obtained and about to be refurbed, so looking good! Cyclops Camera Hire will be offering a "follow me" service this Winter to video you and your friends going hard around the mountains and then providing edited footage for you to keep. Retro Rentals from Mikey & Matt are coming to La Tania this Winter with their 80s luminous ski wear - standby for 80s party nights and lots more one-piece ski suits out on the piste! Cab9 Snowboarding, the British Independent Snowboard Instructors based in Méribel are expanding to La Tania this Winter. They offer a wide range of courses from beginner group lessons, to freestyle sessions in the park and back country guiding. Chef Cath is La Tania resident Cath Haskins' new brand and website for her private chef service providing catering in your chalet for all your dining needs. The new La Tania brochure for 2014 is now available, this year sees it with Russian translations for the first time. On-line version here. Once again there will be a €10 discount when buying a 1-day 3 Valley pass for a Saturday, so it is actually cheaper to ski 3 Valleys than one! NOTE THAT THIS IS ONLY FOR PURCHASES ON-LINE AND THE DISCOUNT IS NOT AVAILABLE AT TICKET OFFICES. La Tania - 4th place in "The most recommended Ski Resort in the World"
Also Weather to Ski voted us 4th in Weather-Proof Ski Resorts. We may be relatively low but those shadowy North facing slopes and all that forest makes a massive difference to keeping snow and allowing decent bad weather skiing conditions. Snow Retreat's Chalet Leman has a new driveway so no climbing all those steps anymore! Alpine Escape will be displaying prints from UK Artist Jessica Zoob in their chalets this season. 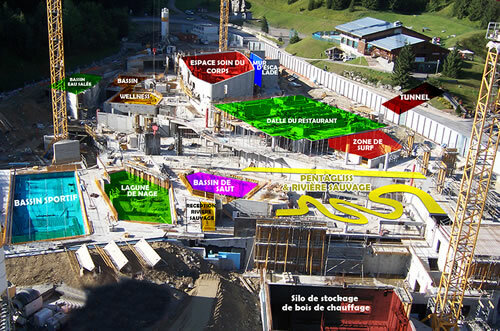 No further news on the Moretta Village development in La Tania and when the definite timescales for this are - there's a presentation of the development here and the new Moretta chairlift is in the S3V plans below. Reports of an improved Wifi service around La Tania (chargeable - provided by The Tourist Office). There should be more available in bars / restaurants too this Winter but becoming less important with the reduction (and the eventual removal) of data roaming charges and competitive data bolt-on packages. The road to Méribel Village from La Tania up towards the Plantin is being repaired again - it's always falling dow the side of the mountain and can be rather tricky in snowy conditions - ask the locals! 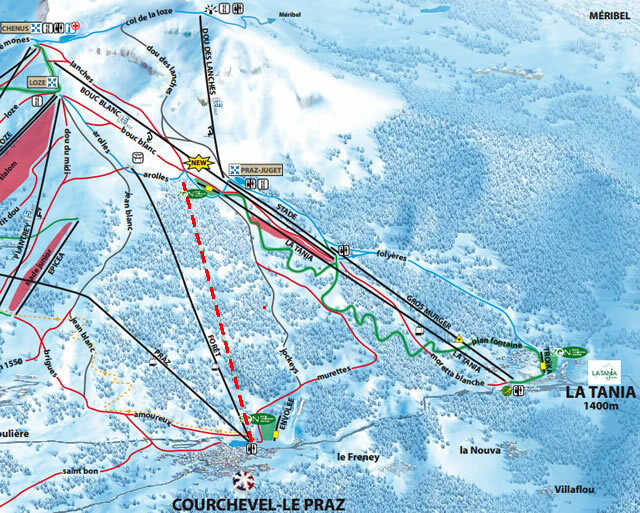 As well as the new La Forêt chair going up to the Bouc Blanc area above (opening Dec 2014) the plans have been released for the next series of lift upgrades. Some €140m to be invested up to 2022. 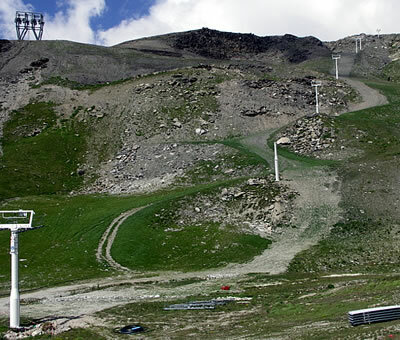 The replacement of the 3-man Aiguille du Fruit with a 6-seater hi-speed detachable chair (shorter in length, so not giving access to the Suisses black piste) and the removal of the fixed 4-man Gravelles chair is expected to be completed for December 2014. The proposed lift up from Bozel via St Bon to the new Aqua centre at 1550 seems to have been put on hold once again with a row over some land it would cross / need pylons on down near the Bozel end. 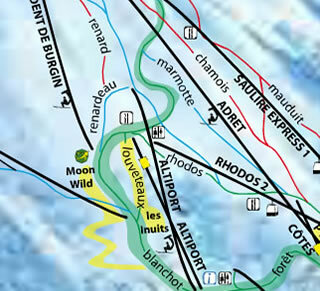 A new piste names Tétras from the Chapelets chair over in 1650 has been created (above) and there's a new Altipôle piste linking across to Mur and around Cave des Creux (below). Mur has been re-graded from red to black. The Rama piste is no longer marked - now part of the bottom of the Park City piste. 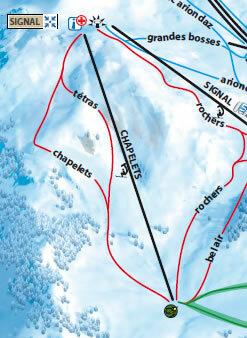 Turcs pistes is no longer marked as Park City is extended at the top and the piste is now all red. Turcs was regularly groomed and although quite steep it was wide & smooth, often making it one of the easiest black runs, great for giving confidence to those with that "black run fear factor" blocker. The Crêtes piste has been removed as the Arolles blue piste down to La Tania is extended and there's a short new section of the Lanches piste at the top of the new Bouc Blanc chair. 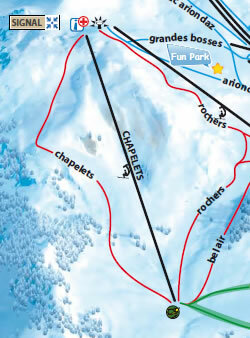 Chabichou, Téléphone and Bellecote piste are now named on the 2014 map. Creux re-graded from red to blue (can be seen on the bottom 2 pics). 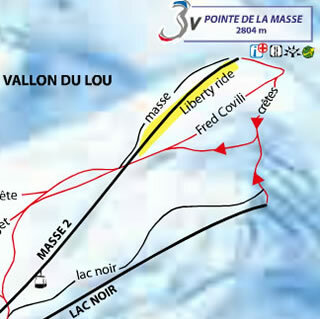 Creux Lac is re-graded from red to blue and the main Creux piste running "over the back" of Saulire is also re-graded from red to blue (see below). The new Plan du Vah piste from Fruit Junction the appeared last season has been removed from the new map - this only took you down to the road for the ski bus - maybe it will re-appear when the piste continues down to 1550 when the new Aqua Park development is completed. 6 seater hi-speed detachable (with covers so more susceptible to wind but a more sheltered route). Capacity of 2,700 skiers per hour at 5.5 m/s. Total Length 1750m. Vertical Rise 643m. Starting Altitude 1259m. Ending Altitude 1902m. Number of Pylons 15. Plenty of building work going on around 1850 and the Aqua Centre below 1550 continues apace with even more cranes involved (that is set to open next Winter). 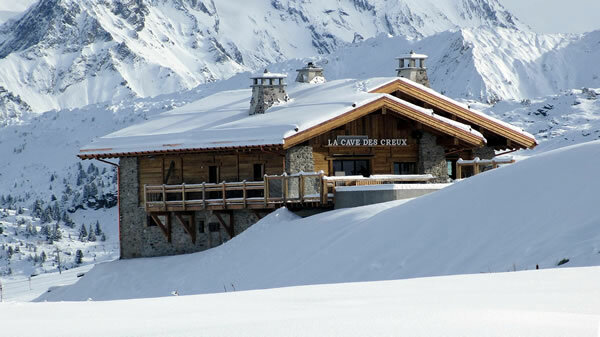 La Cave Des Creux is a new mountain restaurant at the top of the Gravelles lift with views of Mont Blanc and the Courchevel Valley. This former alpine cheese ripening cellar has been converted into a restaurant, where skiers can enjoy a warm and friendly mountain atmosphere. The Le Praz old Gondola are being sold off - reportedly for an amazing $4,000 each - a lot more expensive than previous sales. 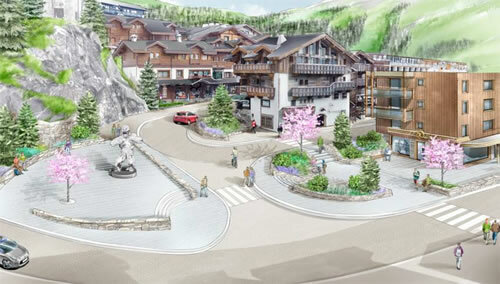 Yet another top 5-star hotel is opening in 1850, this one at the top of Jardin Alpin. L'Apogée Courchevel opens on 11/12/13 we quote "Located on the pristine slopes of the French Alps, L’Apogée Courchevel is the latest masterpiece in the Oetker Collection, recreating the finest European hospitality for which it is renowned, from Hotel du Cap-Eden-Roc to Le Bristol, Paris.in 1850". Pleisure Holidays have a new chalet in Le Praz this Winter - Chalet Josephine A & B, superb location, close to lifts, spacious, very comfortable, their best chalet ever? Looks like Friday Après Ski for Bring Your Sisters at La Boulotte in 1650 - to be confirmed. 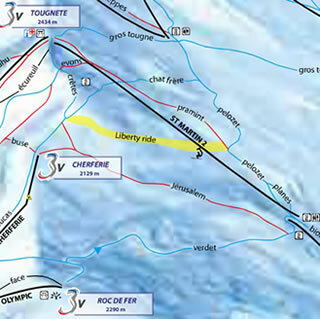 The Ladies FIS World Cup Slalom will once again take place in Courchevel - 17 Dec 2013. Verdons by Night - night skiing start on New Years Day and continues every Wednesday. BMW Polo Masters with horses on the snow at the Altiport takes place from 30 Jan - 02 Feb 2014. 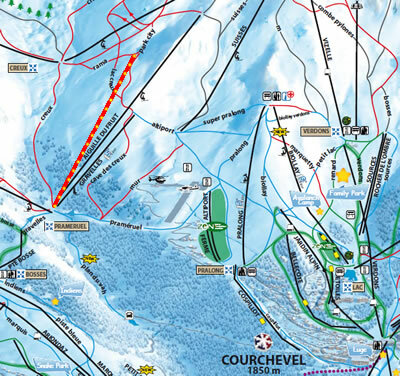 The Courchevel Film Festival - 20 to 22 Mar 2014. 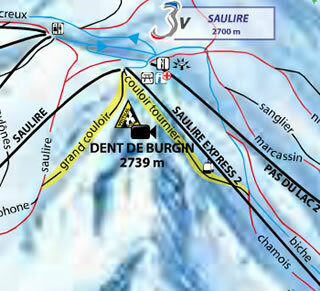 The 3 Valleys Enduro race for all disciplines open to all across the 3V is scheduled for 6 Apr 2014. Méribel gets a branding makeover - Méribel Vallée is prominent around the new heart logo now. The heart word was at the centre of just about everything in their successful bid for the 2015 Alpine Skiing World Championships. The logo will appear across all the villages in the Méribel Valley. We see that major tour operator Crystal has got a new logo too - With a cool green colour being their corporate image this season. 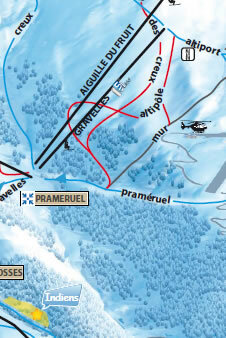 The Louveteux area is a new kids piste in Méribel with an “Inuit Theme”. Could be like the Indiens piste above 1650... Moon Wild is another kids animal themed piste. 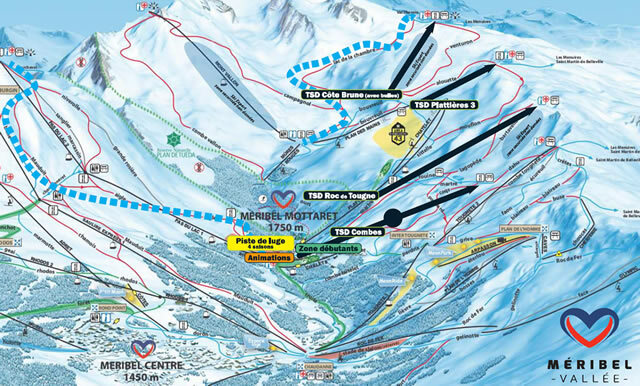 Also the Couloir Tournier above Méribel is now marked on the map after opening last season - The Vertical Xperience area is complete with cameras and a facebook login machine at the top of the piste (honest!) to capture your style on a seriously steep bit of terrain - only Grand Couloir on the other side of Saulire is a steeper marked piste in The 3 Valleys. We hear The Ronnie and Dicks are under new (French) ownership - no confirmation if that's likely to lead to any changes though. Jack's has announced Bring Your Sisters on Wednesday Après for next season. The Rocks brand comes to Méribel with 3 special weeks of live music, DJs and Parties in association with Ski France. 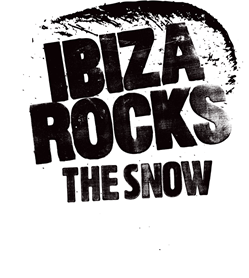 Ibiza Rocks The Snow weeks are 14-21 Dec, 8-15 Feb and 29 Mar-5 Apr with loads of events, pool parties, ice disco, street food fest, extreme sports showcase in the board park and top live performances too. The forst week line up consists of MistaJam, Clean Bandit, DOORLY, Nicola Bear, Ste-V-Something, Patrick Nazemi, K1r3y plus official Club partners Propaganda, We Are Your Friends, Troupe Records & Spacestation plus more to be announced. Hotel Le Mottaret now has the new and exciting Café del Mott - a lively 400m2 terrace with great views and plans to host afternoon BBQs with Rocks DJs and even has a steaming hot tub if you're in the mood! As well as the Café del Mott, there is another great Après Ski venue in Mottaret on a Tuesday night as we hear that Le Rastro will revive their crazy dancing on the tables Woodstock Night. Legendary 70s & 80s DJ and pink one-piece ski suit wearer Rob Smart back on the decks we think. The top of Sunny Express sees an amateur Speed skiing piste created to capture your top speed in a safe environment. and the new toboggan on rails will be open this Winter too in Les Menuires- a 1200m run in complete safety. Les Menuires will host the first Roc’n Bike Festival on 18th and 19th January 2014 - where Mountain Biking events on the snow will take place! Two new luxury chalets in Saint Martin de Belleville at the bottom of the pistes are now available to rent from Ski Talini. Further upgrades to several accommodations are taking place and a new snowflake grading system is being introduces in the Belleville Valley. Guided tours of the St Martin village and the museum are now available every Wednesday afternoon from the Saint Martin de Belleville Tourist Office. The 3 Valleys 1 chair has been replaced with the new Pionniers Chair - this also has pedestrian access cabins - allowing up and downloading to the Folie Douce no doubt! A much faster ride on the new detachable hi-speed than the slow old chair. Also being replaced (or rather refurbished and using the same pylons) is the 2 Lacs chair to make it easier for beginners with different access and exit points. The 2 Lacs kit is then being used to upgrade the old 3 Valleys 2 (now to be known as the 3 Vallées Chair) so there will be 2 high speed detachable chairs to get you out of the Valley and a good alternative to the 3 Vallées Funitel and/or Plein Sud route. Work on the new Club Med next to the Hotel Altineige continues and the Hotel Altapura continues to win awards - At least one couple from La Tania skied over and spent the night there (the concierge demanding to take the small backpack they had to the luggage porters as they checked in wearing full ski kit). The new Peyron lift in the 4th Valley above Orelle give much faster uplift (4 minutes instead of 15 minutes) and access to the Bouchet chair. The Bouchet chairlift will give access to a new zip wire - this looks quite mad and very high as it crosses right across the off piste area of the Lory Valley. Can't wait to give it a go though - although €50 a trip seems a bit steep! 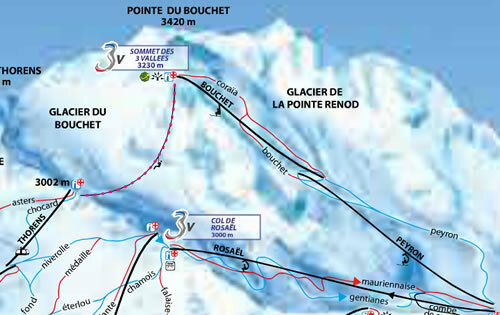 The zip wire will link the top of Orelle (top of the chairlift “Bouchet” at 3,230m) and Val Thorens (top of the “Funitel de Thorens” at 3,000m), with a 1,300m long zip line. 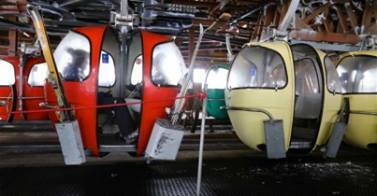 Riders on the new thrill ride will descend up to 250 metres above the resort’s glacier. Thanks as always to Nick Ski, Francis, Ferg, Phil, etc for all the pics, info and gossip!